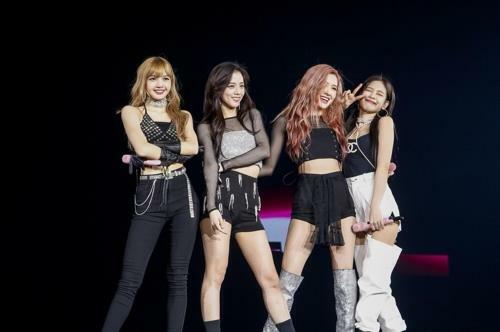 SEOUL, July 25 (Yonhap) — K-pop girl band BLACKPINK will release a Japanese-language version of its latest hit song “DDU-DU DDU-DU” next month, its management agency said Wednesday. “BLACKPINK’s first EP ‘Square Up’ topped the iTunes album chart in Japan. … On back of the popularity, (we) plan to release a record in Japan on Aug. 22, which includes a Japanese language version of the main song ‘DDU-DU DDU-DU,’” YG Entertainment said. The latest BLACKPINK album, released June 15, made history for K-pop female acts by climbing as high as 40th place on the Billboard chart of the 200 most popular albums. Its main track also peaked at 55th place on the highly competitive Billboard “Hot 100″ song chart. The music video of the dance song garnered more than 200 million YouTube views in the first 33 days upon its release. On Tuesday, the quartet set off on an arena tour in Japan, which will take them to Osaka, Fukuoka and Chiba in July and August.